UBC Music students are available to perform for receptions and other events. There is a variety of chamber groups and individual musical offerings for you to choose from on our Student Performance Engagement List. In order to be included on the list students are required audition and submit a recommendation from their performance teacher. This is an opportunity for students to learn what it is to be a working musician, they negotiate their own fees and work out repertoire and other details relating to the event with you. Experienced Student Performers: Level of performance and professionalism appropriate for any event including performing short concerts, receptions, and High Profile events. Apprentice Student Performers: Level of performance appropriate for receptions. Formed in 2015, Artemisia Duo is an ensemble comprised of flutist Emily Richardson and pianist Susan Xia. Our name “Artemisia” draws upon the root “Artemis”, the Greek goddess of wild animals and the moon. The name Artemisia also has a long history in the arts, as the name of an accomplished female painter in the Baroque period. In addition, it combines segments of our names with the word “art”, signifying our collaborative approach to creating music together. Artemisia Duo has performed as part of the UBC Tunes at Noon Series and the Concerts in Care program in Vancouver. We are especially passionate about making classical music accessible to all audiences, but have experience exploring various genres and styles of music. If you have a request and there is enough time, we are happy to accommodate you. We are enthusiastic about music and look forward to bringing this to your event. The Four on Four String Quartet is a returning string quartet comprised of most upper year and graduate students from the School of Music at The University of British Columbia. Daniel Tsui (violin), Melody Chen (violin), Denny Ho (viola), and Kimberley Kistler (cello) are completing their Bachelor of Music degrees. All members have an extensive amount of chamber music experience ranging from classical to popular music. Many of our group members have previous experience with receptions and other events. Special music requests may be accommodated if contacted in advance. The Four on Four String Quartet is confident to exceed expectations and bring you the many wonders of music! Feedback from a client: “We couldn’t have been happier with the Four on Four String Quartet for our wedding ceremony. Daniel and the group were so easy to work with, were very responsive, flexible, and of course very talented! They learned a new song for our wedding in under three weeks and played it beautifully, and their performance throughout our ceremony was excellent. All of our guests really enjoyed the music as well. 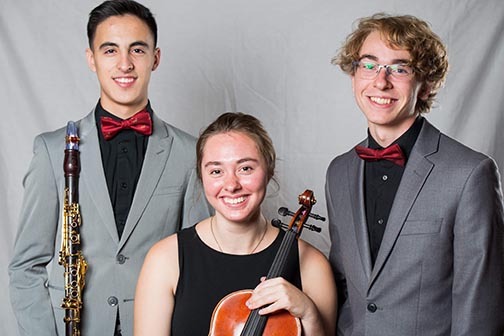 The Genesis Trio, founded by clarinetist, Jonathan López, violist, Nina Weber, and pianist, Markus Masaites, has come to be known as one of the premier student chamber ensembles at the University of British Colombia. The three members are all in their second year of study in pursuit of their undergraudate degree in performance. Established through a shared passion for performing and love for chamber music, the Genesis Trio has performed for a variety of audiences, garnering city-wide acclaim. The three have a primarily classical background but perform a variety of different genres including jazz and folk music. The Genesis Trio receives weekly coachings with esteemed Professor of Clarinet and Chamber Music Jose Franch-Ballester and bi-weekly sessions with Professor of Chamber Music Rena Sharon. 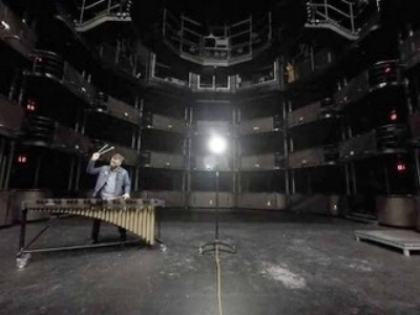 Aaron Graham is an award-winning Percussionist, composer, and educator. He is currently a Doctoral Fellow at the University of British Columbia pursuing a Doctorate of Musical Arts, where he also teaches percussion courses. He is a member of the Percussive Arts Society Scholarly Research Committee, Black Swamp Percussion Educator’s Network, and won the 2014 Percussive Arts Society International Composition Contest. He has also travelled the world playing percussion with various pop, rock, and country groups. As a marimbist, Aaron frequently performs across the Lower Mainland, presenting an exciting display of the expressive potential of the marimba, through a mix of popular song arrangements, jazz improvisations, and contemporary versions of classical favourites. Steinway Artist John Stetch has released 15 CDs, is a 6-time Juno Nominee, and has written over 50 compositions for solo piano, jazz combo and more recently some classical chamber formats. Originally from Edmonton, he has worked at the top clubs of New York City including Mezzrow, Smalls, Smoke and the Jazz Standard, played on many continents, toured Canada a dozen times as a leader, and was a member of Rufus Reid’s group for nearly a decade. He taught at Cornell University for several years and was a finalist in the Thelonious Monk Competition twice - once as a composer and once as a performer. Stetch is especially interested in bringing classical and jazz together, and fusing ethnic and popular music with his personal jazz stamp. He has recently relocated to Vancouver and is currently pursuing a Master’s of Music in classical Composition at UBC. Thunderbird Brass is the Vancouver-based international collaborative effort of Matheus Moraes (trumpet), Silas Friesen (trumpet), Kristin Ranshaw (horn), Kevin Jackson (trombone), and Takumi Hayashi (tuba). At home across styles from classical to Star Wars, each of their members are also accomplished performers in their own right, having played with the Vancouver Symphony Orchestra, Petrobras Symphony Orchestra (Brazil), Saskatoon Jazz Orchestra, Band of the Ceremonial Guard, the 15th Field Royal Canadian Artillery Band, Tommy Banks, Allen Vizzutti, and more. Their flexibility and professionalism is suited well for any events, including weddings, corporate parties, holiday events, and private functions. The Ubuntu String Quartet specializes in non-conventional repertoire, such as folk tunes, mainstream, jazz, and video game music in addition to their classical collection. Ubuntu is South African for “human compassion” and also the idiom “I am what I am through each of us,” which reflects their group chemistry. Their familiarity and friendship with each other has sprouted strong bonding during rehearsals, which is evident in their performances. In addition to performing on the Tunes at Noon series at UBC, the USQ has performed for company events, formals, weddings, and even comedy shows. Duo Imperiosus, founded by violist, Nina Weber and pianist, Anican Yu, combine classical and jazz styles together through a shared love of improvisation between the two performers. Weber, a classically trained violist, and Yu, a jazz piano enthusiast are both second year students in pursuit of their undergrad degrees at the University of British Columbia. During their first year, they formed this duo to participate in performance classes at the School and were lucky enough to receive opportunities to perform for fellow students and professors. Duo Imperiosus has also received accolades for their numerous videos on social media showcasing improvisation and their jazz arrangements. The Double-A Duo is a piano and cello duo made up of Adrian Pang cello and Anican Yu piano. They have an innate talent for improvisation and performing by ear. This means that this group can play almost any requested song given fair notice ahead of time to prepare without the need to arrange sheet music! Their strengths lie in repertoire consisting of jazz, ballads, and pop songs. 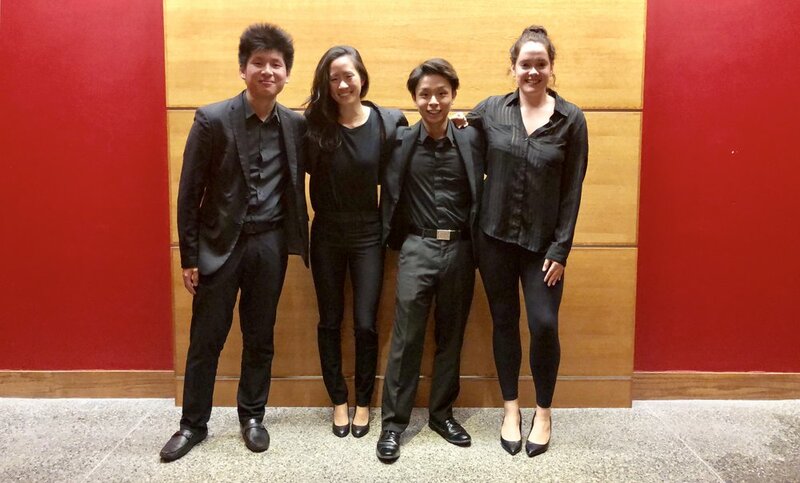 Having met each other at the UBC School of Music, their bond has led them to also become members of the student council and represent the School of Music at the Alma Mater Society of UBC. The Double-A Duo’s members have experience performing at concert series, weddings, receptions, company events, and formals. Their versatility allows them to play almost anywhere (provided there is a piano)! Connect directly with the student musicians on the Student Performance Engagement List. After your event, please let us know how it went! How well did the student(s) perform? Did the student musician(s) arrive on time, perform appropriate repertoire, bring all necessary equipment with them, and follow instructions on where to be and when to perform?